Crayons are sneaky little things. They randomly end up in the dryer and can easily ruin a whole load of clothes. Or your little one ends up with more crayon marks on her shirt than her paper. Crayon marks are one of those stains that can be very difficult to remove. Hopefully, your crayon colored clothes haven’t gone through the dryer yet. The heat can set the crayon stains permanently. 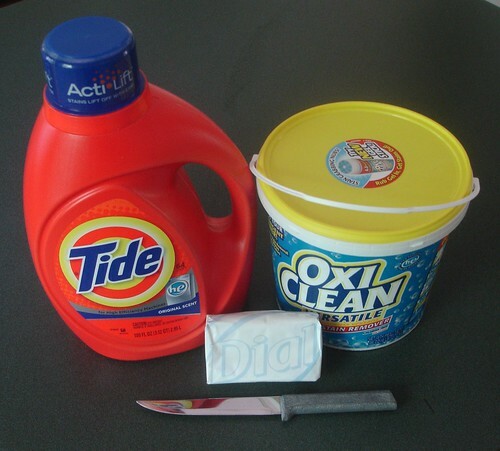 For crayon removal, you’ll need: a sharp knife, a bar of good quality soap, Oxi Clean and premium detergent (Tide, Arm & Hammer, Gain, etc – nothing generic). 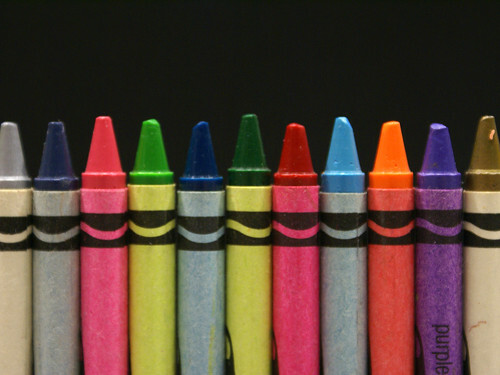 If there is a lot of waxy crayon build-up on the stain, remove as much as you can with a very sharp knife. Gently lift up as many of the waxy parts as you can with the pointed end of the knife. Wet a bar of soap and rub the soap directly onto the stain on the front of the fabric and the back. You want to completely drench the stain in bar soap. You can use Fels Naptha, Zote, Dial or any good quality bar soap. Wash the garment in the hottest water the fabric can tolerate. Make sure you hang the item to dry and don’t dry it in the dryer until you are pleased with your results. If the crayon stain is still there, proceed with The Soak and that should take care of any remaining stains left on the fabric. But what if the whole load is stained? What if there was a crayon in the dryer and now you’ve got a huge crayon mess on your hands? Put the whole load back into the washing machine. If you have a top-loader, fill the drum with hot water and dissolve an entire scoop of Oxi Clean. Let the clothes soak for several hours. Then wash the load with premium detergent on the longest wash cycle possible, so the clothes are highly agitated. Between the water temperature, the Oxi Clean/detergent and the agitation of the washer you’ll hopefully end up with a load of crayon-free clothes. If you don’t have a top-loader, your options are to spend a few hours at the laundry mat using one of their top-loaders or finding a friend with a top-loader who will let you come over for awhile. Side Note: I don’t recommend using a front-loader in this instance since you can’t soak loads for long periods of time. Front-loaders are fabulous for many reasons, but not being able to soak a load of clothes is a huge drawback, in my opinion. After the washer cycle is complete, ensure the stains are removed to your liking before drying them in the dryer. Even though it’s time consuming, you could go over each piece of crayon-stained clothing with a bar of soap in the method described above. If it’s a load of nice quality clothes, it would be worth your time to do so. I haven’t had to wash out crayon stains from clothing yet but my secret to crayon marks on the table, floor, etc. is dry erase crayolas. One swipe of a baby wipe and it’s all gone! Miranda – I’ve never seen dry erase Crayolas!! I’ll have to check those out, because I feel like there is crayon all over everything lately! Ack. I’ve had luck using baking soda in the wash, especially if the crayon got on the clothing because a crayon was left in a pocket during the first wash cycle. That, and of course, as you said, very hot water. The hot water really helps loosen the crayon and help remove it from the clothing. Crayons…what a nightmare! I have not had happen recently, but usually just pitched!!! Thanks for these very helpful tips. Crayon marks from clothes are what we normally encounter since we also have small kids. Thanks for sharing. i have dried my daughters and my son school uniform and now i have multiple color stains all over their khaki pants and im about to go nuts and scrub them off with my hands …..this is just insane … but i willl try to go by these tips that i found on the website and i will let you know.